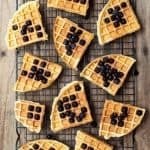 These Thermomix Buttermilk Waffles are perfect for lazy weekend brunches when there’s no rush to do anything. Fluffy on the inside and crispy on the outside they’re even more delicious topped with your favourite toppings. This is an adaption of a Martha Stewart recipe I found on her website – I’ve converted the ingredients as best I can and am really happy with the way they’ve turned out. I’ve recently bought a Breville waffle iron as I wanted a change from the usual pancakes we have at weekends, plus the children can use it safely without turning on the gas stove and risk burning the house down. 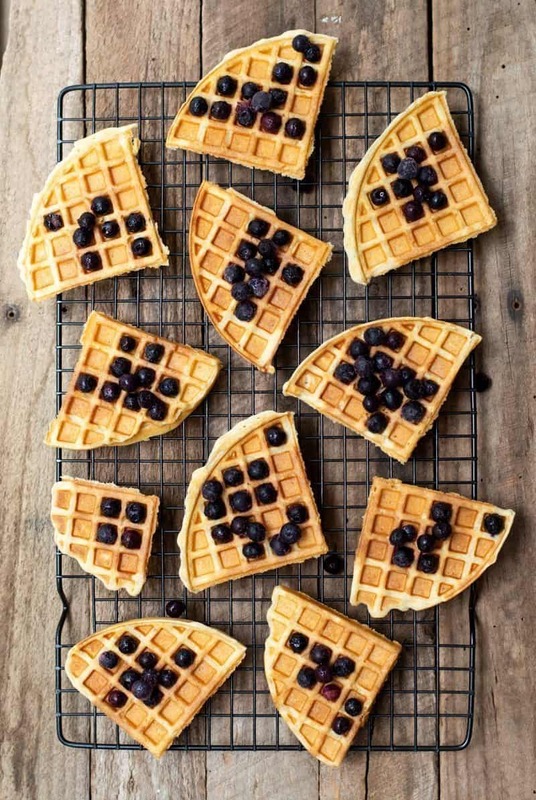 The great thing about these waffles is they freeze really well so you can make a big batch and freeze them to have for breakfast during the week. The trick is to cool them first on a wire rack so they don’t go soggy and then pop them in a zip lock bag to freeze. For perfect instant waffles, just pop them in a toaster to thaw out and heat up. 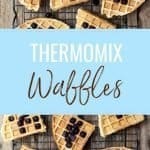 Fluffy on the inside and crispy on the outside, these Thermomix Waffles taste even more delicious topped with your favourite toppings. Heat up the waffle iron according to the manufacturers instructions. Start by melting the butter in a pan on the stove or in the microwave until fully melted. Weigh the flour into the Thermomix bowl and add the baking powder, bi-carb soda, salt and sugar. Add the buttermilk, eggs and melted butter into the Thermomix bowl. Mix 3 sec/speed 5, open lid and give the mixture a quick scrape down and stir to dispel of any lumps then mix again for 3 sec/speed 5. Pour the mixture into the waffle iron and cook as you would. Serve immediately or cool on a wire rack to freeze. To Freeze – cool the Thermomix Waffles on wire rack until fully cooled then place them into zip lock bags or an airtight container to freeze. To thaw out just pop in the toaster for a few minutes until hot.